The species that carries Zika, A. aegypti, is unlikely to be found in New York. However, the related species A. albopictus is prevalent and quite concerning. So this question is focusing on A. albopictus (if I may editorialize I would suggest leaving the title closer to the real question of interest, and disambiguating the species as the first step in resolving it). I understand New York has IIRC the aegypti species and Zika has appeared. My apartment gets mosquitos rather randomly every couple months. Understandably I want to figure out how much effort I should put into preventing or getting rid of them. I can describe their behavior here and maybe that's enough information. If not, do I need to get out a magnifying glass or sequence DNA? (Which I did once in college but I wasn't very good at it). I get "bursts" of them at random times in the year - more in the warm months but also in November. We had a warm winter but this still surprised me. They seem to bite me at night but I've never had a mosquito bite on me. I've had mosquito bites from being bitten by mosquitos before, so unless I've developed a resistance to that in the last few years, that's strange. I haven't found any evidence of standing water nearby. They don't hover around my sinks or toilets. I read once the Zika carrying strain is on the hardy side and can live off of moisture in walls so this is troubling. If you're curious my preferred life hack is keeping my living room slightly warmer than my bedroom. And also, you know, killing all of them. So, are these behavior traits useful? Can I identify them as opposed to other New York inhabiting mosquitos? Is a DNA test necessary? Aedes aegypti has not been found in New York City. ...(emphasis theirs) which seems pretty clear cut. However, the CDC recently published a map claiming that NYC is within the potential range of Aedes aegypti. The new estimated range maps have been updated from a variety of published and unpublished sources. A related species, Aedes albopictus, is sometimes found in NYC during the summer and is probably capable of transmitting the strain of zika virus currently circulating in the Americas (see for example this recently-published experimental infection study). Aedes albopictus has been the major vector in some previous zika outbreaks in other parts of the world. (Edit (14th June): A group of mostly-CDC entomologists just published a map of locations where Aedes aegypti and Aedes albopictus have actually been collected between 1995 and 2016 here, and there's an NPR article explaining why the maps are different here). Maps are not meant to represent risk for spread of disease. But you've asked whether the mosquitoes in question can carry zika, not whether they're likely to be good at it, so I'll leave it there. The short answer is that if they're Aedes mosquitoes, then they might be able to. So how do you know if they're Aedes mosquitoes? 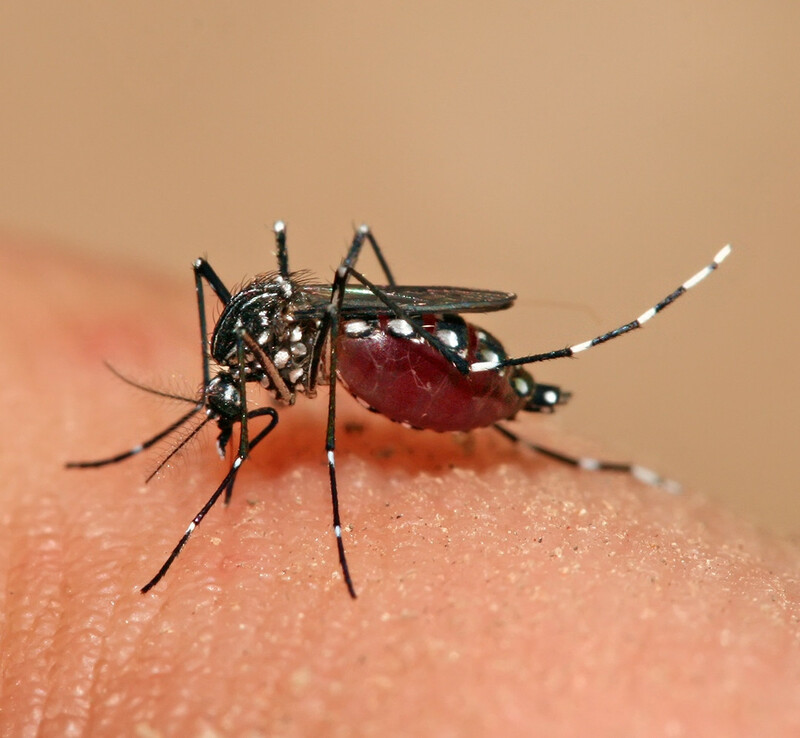 Aedes are visually quite distinctive; they have black bodies with white stripy abdomen and legs: (Image taken by Muhammad Mahdi Karim; details and license here). Aedes are also generally day-biters, so if you're getting bitten at night that makes me suspect you've got something like Culex mosquitoes instead (which might be able to spread West Nile virus, although that's a different story). These are dull brown. There are better images here but I think these are under copyright. You're very much out of range of Aedes Aegypti, which is the primary carrier of Zika. Albocitus is a much more theoretical carrier, whose potential for spreading disease is much less. There have been no locally acquired cases in the mainland US this year. The odds of a New Yorker being the first to catch it are ridiculously long. Not the answer you're looking for? Browse other questions tagged human-biology virus epidemiology or ask your own question. How can just new born baby can walk ?